On Friday, October 13, 2017, West Liberty University’s Alumni Association added the names of three distinguished alumni to its Wall of Honor. Alumni John Hennen, Katie Kacmarik and Al Roszczyk were inducted during the invitation-only President’s Recognition Dinner as one of many events during Homecoming 2017. As West Liberty President Dr. Stephen Greiner states, “These alumni are exceptional professionals who inspire us to do our best. We are proud to share their stories and achievements and to honor them in this way." "Our success as a business is the product of exceptional individuals demonstrating a passionate commitment to the patients we serve, our team of professionals, and our organization. We are all very proud of Katie for the recognition she has received for her commitment to West Liberty, achievements in her profession, and accomplishments at Moundsville Pharmacy." explains Jason Turner, owner and pharmacist at Moundsville Pharmacy. Moundsville Pharmacy staff and her family were able to attend the awards ceremony. Katie's words of acceptance focused on her time at West Liberty and the impact her experiences have had on her professional career. On Saturday, October 14th, Kacmarik and fellow inductees were recognized at West Liberty football halftime. 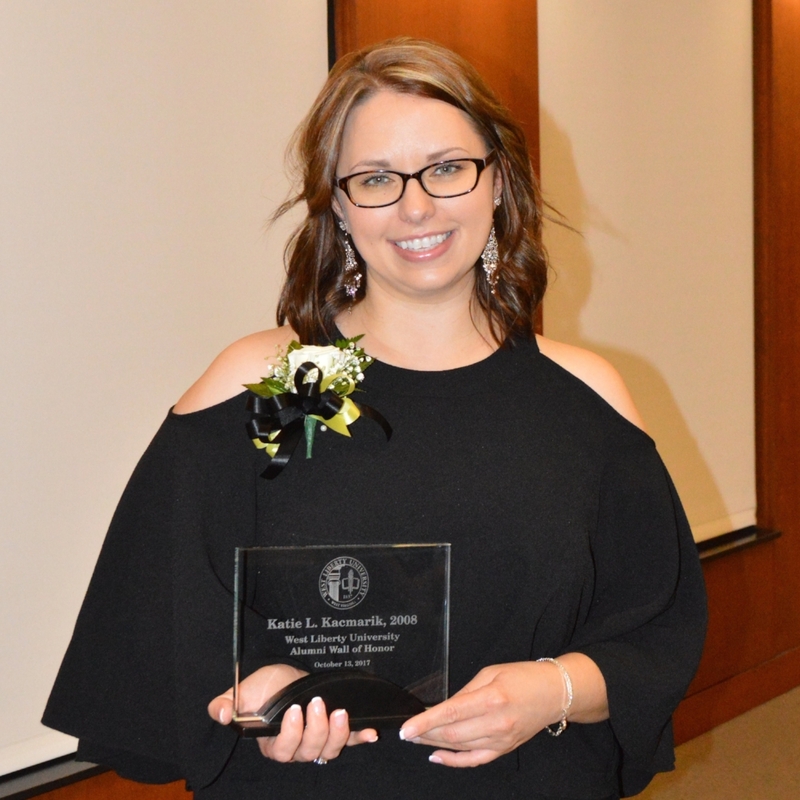 Katie Kacmarik earned her bachelor’s degree in biology at West Liberty in 2008 and went on to earn a Doctor of Pharmacy degree at West Virginia University in 2012. While at WLU, she served with the Student Government Association, was advertising manager of the Trumpet, president of the Biology Club, and spent summer months with the WV-INBRE biomedical research program. While at West Virginia University, she served as National Community Pharmacists Association (NCPA) chapter president and received the Dean’s Volunteer Service Award and NCPA Presidential Scholarship. Kacmarik is currently a managing pharmacist at Moundsville Pharmacy and is certified in diabetes, immunizations, and medication therapy management; and collaborates with the WVU Extension on its Dining with Diabetes program. In 2016, she was recognized as the Ohio-Marshall County Pharmacist of the Year. In 2015, she shared in the recognition of Pharmacy Development Services’ Pharmacist of the Year for co-developing SyncRx and she also co-facilitates intensive trainings for pharmacy owners and teams throughout the country. She serves as president of Ohio Marshall County Pharmacists Association and a member and past executive board member of the West Virginia Pharmacists Association and is a member of Professional Compounding Centers of America, National Community Pharmacists Association and American Public Health Association. She also serves on WLU’s College of Sciences Advisory Board and resides in Wheeling. A blog about pharmacy-new stories, announcements, services, and events.